Now there is the perfect Thomas The Train Backpack. Young or old can now be having a backpack with Thomas the tank engine on it that is just smiling at anyone walking behind you. 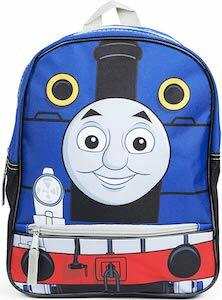 The Thomas and Friends backpack is 12 x 10 inches and has adjustable straps for the perfect fit. And there is plenty of space in this train backpack with lots of pockets. Kids that love Thomas are going to love using this backpack and not just for school as this bag is great for day trips and other adventures too and most importantly now your child can carry some of its own stuff. 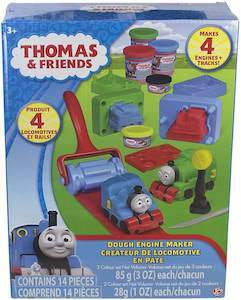 If your child love to build things and like Thomas the train then you should check out this Thomas & Friends play dough set. The set includes the dough in 5 different colors and molds to make trains and a roller to make track. There are details too to add to your trains like the face of Thomas. The fun kids toy is rated ages 3 and up and is good for hours of fun as you can recreating things as it is dough and as there are 5 colors you can build you own color trains and you could even make things by mixing colors. If your child is afraid of the dark and loves Thomas the tank engine then you should surprise them with this Thomas the train night light. The night light is available in many colors and is an LED light so it is cool to the touch and it has a sensor in it so that it turns itself on when it gets dark. 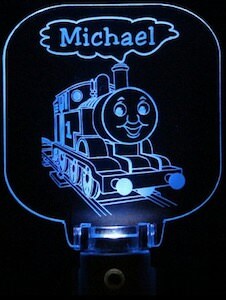 On the night light, you can see the famous Thomas train running on a track and the smoke coming from the train makes a cloud and in the cloud, it will have the name of your child as it is a personalized item. If your child is crazy about Thomas the Train and would like a cool way to carry its candy then this treat pail is what they need. The molded plastic treat bag is shaped like Thomas the tank engine and is great for collecting easter eggs and even better it is perfect for trick or treat on Halloween. As it is made from plastic it is just a cool piece that even after collecting candy you child will love to play with it and maybe store other toys inside it. This Christmas you can surprise your little one with a Thomas & Friends wooden railway that is all about Santa and his workshop. 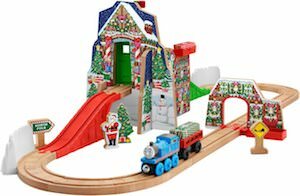 This is the Thomas & Friends Santa’s Workshop Express Wooden Railway and that means that there is a special Thomas the Tank Engine with snow all over it and he needs to go to Santa’s workshop to pick up a big present that needs to be delivered. Beside the track and the train, there are signs to and even Santa Claus is part of this Fisher-Price wooden railroad. And even though this is a Christmas toy you can still use it with all your other Thomas wooden railway toys. If you are looking for the perfect Christmas stocking for your child then how about one that has Thomas the train on it. 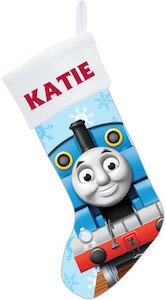 The stocking has a light blue background with snowflakes and on the front it has a big picture of Thomas the Tank Engine and on the white cuff it can have your child’s name (no extra cost) to make it even more personal. The Thomas & Friends Christmas stocking is 16 x 7 inch and is just perfect for a big fan of Thomas the train and of course it has lots of place for Santa to put presents in to. 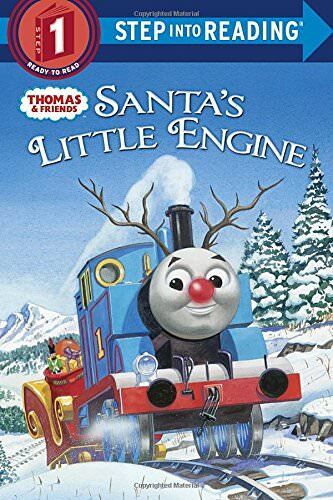 This Christmas book if for all the kids that want to learn to read and like Thomas the train. The book is called “Santa’s Little Engine” and is all about Thomas & Friends, snow and Christmas. In the book you find 32 pages of pictures and a story and it’ made from children ages 4 – 6. You can get this Thomas book in kindle or paper versions so that you can choose how to enjoy some reading time with you child. I am sure that young and old will enjoy the adventure of Thomas the train and his friends. 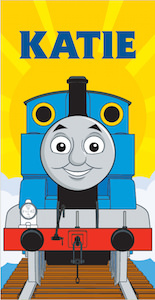 Make your Thomas the Train loving kid feel even more special with this beach towel. This beach towel is not just any beach towel it is a personalized Thomas towel. The towel shows Thomas the Tank Engine on the track with the yellow sun right behind him. And to make this towel better and more special above the train it says a name and that can be the name of your child. Yes this towel will be personalized specially for your kid and can hold up to 12 characters. And witch child won’t feel specially knowing that Thomas made this train towel with their name on it. Surprise you child with this Thomas & Friend Personalized Sunshine Beach Towel. Kids are gone love this Christmas tree ornament of Thomas the Train. The ornament shows the front of Thomas with the railroad tracks and Thomas the Tank Engine even has Christmas decoration on it that sparkle. But what makes this ornament even more special is the name of your kid on the cloud of smoke above Thomas. Yes this is a personalized Christmas ornament and it can hold a name of up to 9 characters. Just imagine your kids name on a Christmas ornament they like. 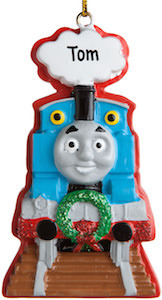 The Thomas the train ornament is 3.5 inch tall and comes with a ribbon to hang it in your Christmas tree. If you kids like Thomas and trains then you have to get them this Thomas The Train Personalized Christmas Ornament. CHOO! CHOOOO! All aboard the train. Featured here is a Power Wheels train that looks just like Thomas the Train from the hit kids television series Thomas And Friends, find the blue and red train with the friendly face of thomas on the front and a really cool feature is the sounds from Thomas And Friends that will play when you ride. 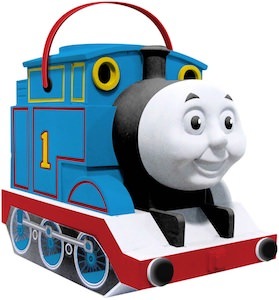 Made to easily operate safely with a push button and the track assembles very easy snaping together, this Thomas the Train includes the track and a 6-volt battery with charger. 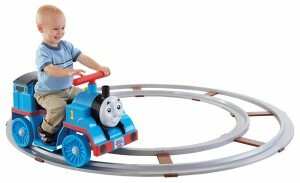 Have a great ride with this Power Wheels Thomas The Train With Track.